We started the day in Valentine, NE with high hopes, but also concern as we were under a robust cloud deck in the morning. This burnt off rapidly as we head north into our target area near Wall, SD. Arriving at Wall, it seemed like it would still be some time before initiation so the group dispersed into Wall Drug for lunch. Coming out of Dairy Queen, we looked to the south only to see a giant developing supercell already with a large tail cloud to our south! 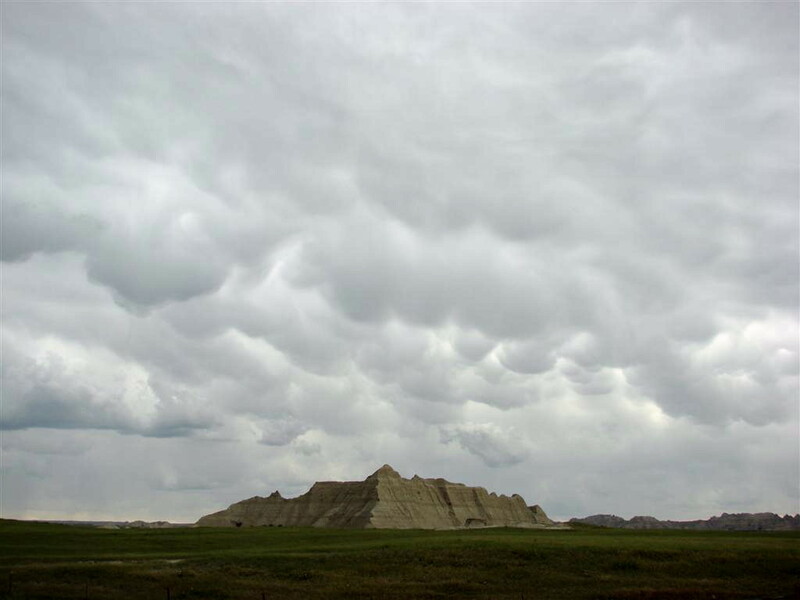 We hurried to gather the group and blasted west out of Wall, then south into the Badlands National Park. The storm got it’s act together very quickly. We headed through the park and arrived in Interior, SD just in time for the storm to drop a long cone-like tornado near Kyle, SD about 25 miles south of us that was on the ground for about 20 minutes. 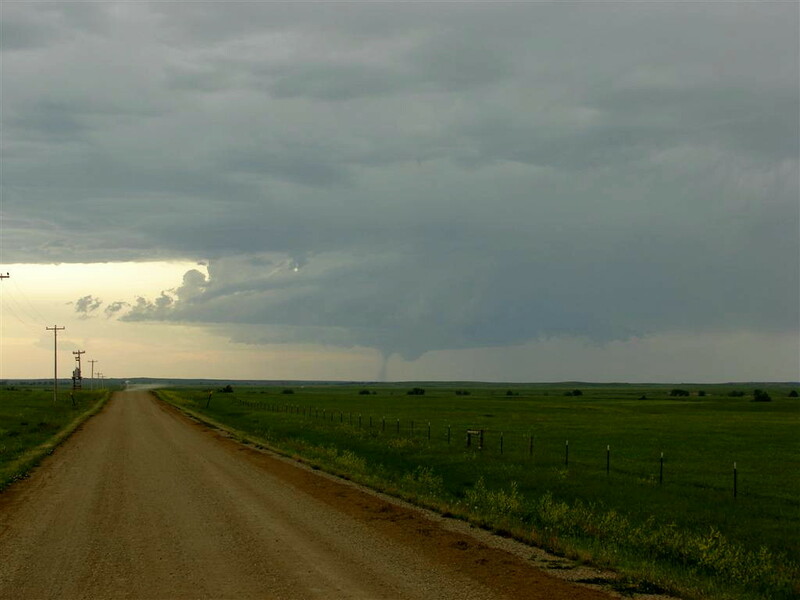 The tornado looked to be fairly weak and the motion was not very dynamic from our vantage, but considering the distance we were from it, the tornado must have been in excess of 5000 feet long. There were a number of instances where it had a very pronounced debris fan. After the tornado we decided to plunge south out of Interior to get back in position within the notch near the now cycling wall cloud, but unfortunately we were cut off by the hail core and had to run quickly to the north back through the Badlands. As we reached I-90 and bolted east, it was clear that the storm had transitioned into a monster HP hailer and the tornado threat was rapidly diminishing. 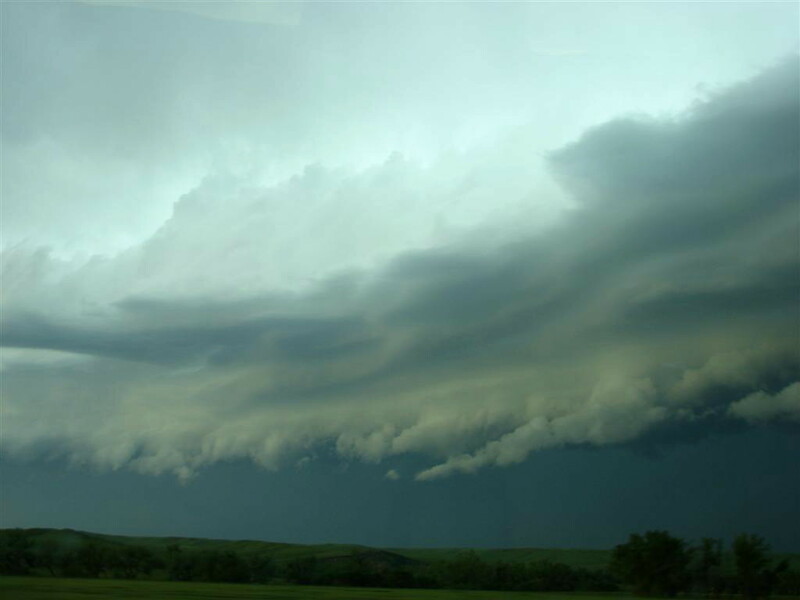 We decided to head north out of Kadoka and stayed just ahead of the storm all the way to Pierre, stopping several times to take photos of the fantastic shelf structure. After dinner we drove to Sioux Falls for the night where we were intercepted (actually followed all the way from Mitchell) by a news crew that wanted to interview the group. The interviews were on TV the following morning as we ate breakfast. 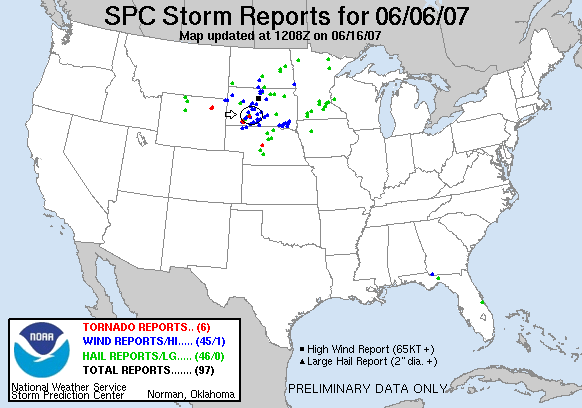 An SPC moderate threat day: We leave lunch at Wall Drug in Wall, SD only to find a supercell exploding to our south! 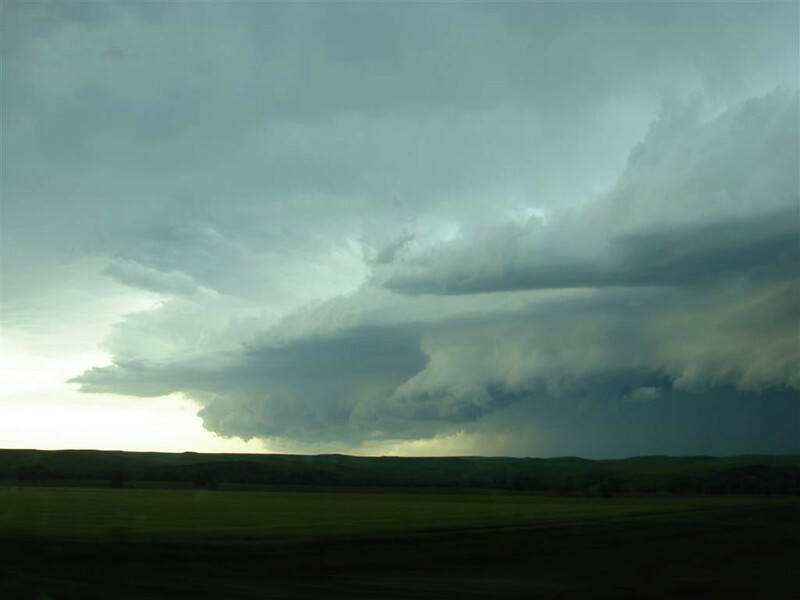 A Radar image of the storm as it heads for the Badlands while we approach from the north. 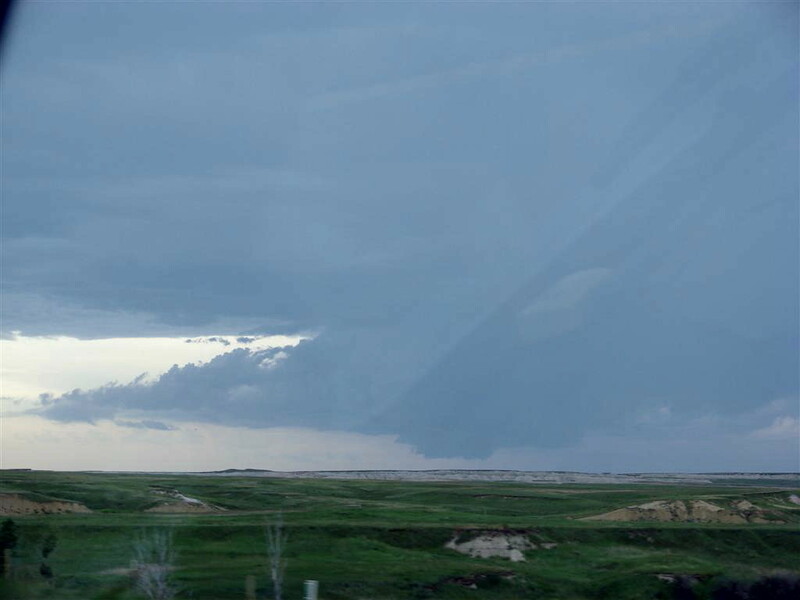 This young storm already has a well defined beaver tail and wall cloud as we get into the Badlands. And just And just like that, tornado! Note the funnel protruding from the wall cloud and debris field on the ground. 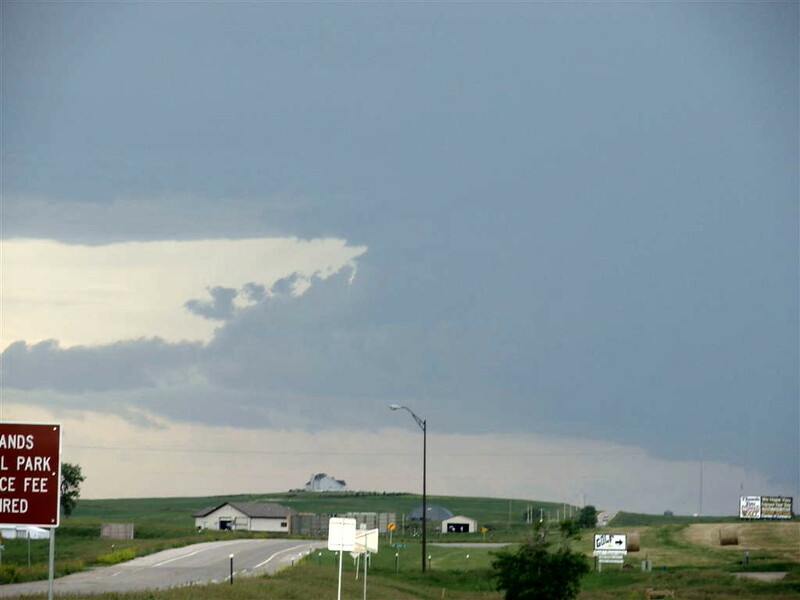 Almost looks like it's trying to develop a satellite tornado on the northwest edge of the wall cloud. 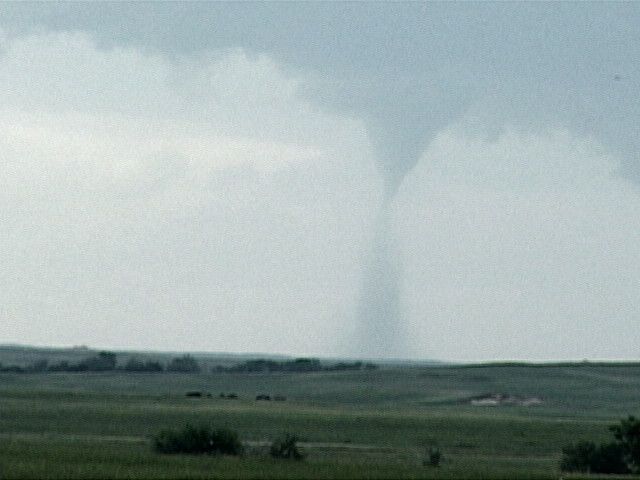 Funnel extends 2/3 of the way to the ground. Debris reaches all the way up to the funnel. This tornado is over 20 miles from us but the road network in the Badlands National Park won't allow us to get any closer. Enhanced to get a better look at the tornado. 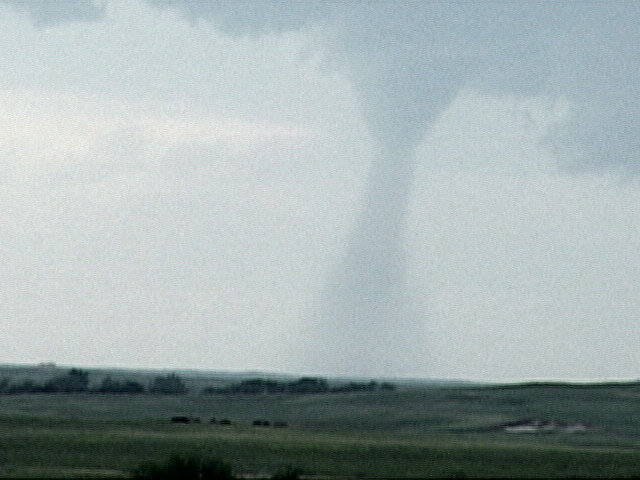 Wide shot of the whole storm with the tornado. The debris fan widens out. Enhanced to get a better look at the tornado This tornado was on the ground for about 20 minutes in several different forms, but didn't show much dynamic motion. 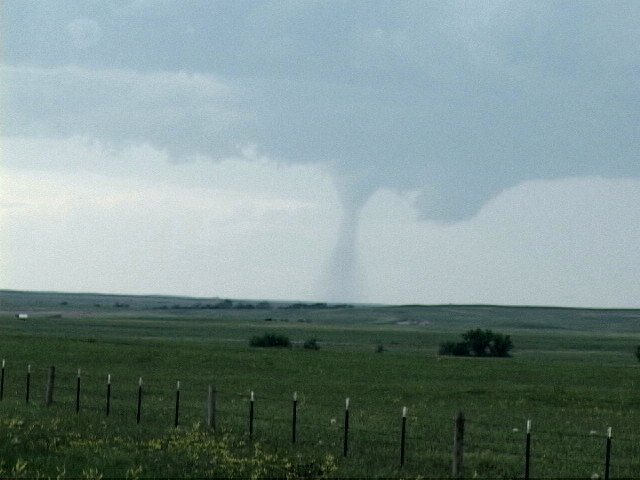 This was a tall tornado, probably with a cloud base of 5000 feet. Enhanced look to get a better view of the structure. IT looked like it was trying to drop a second tornado here. Meanwhile, nice mammatus develop under the anvil directly behind us. With the tornado dissipated, we charge south trying to reposition in the notch for another round. The wall cloud cycling while we try to get south before the hail core cuts the road off. 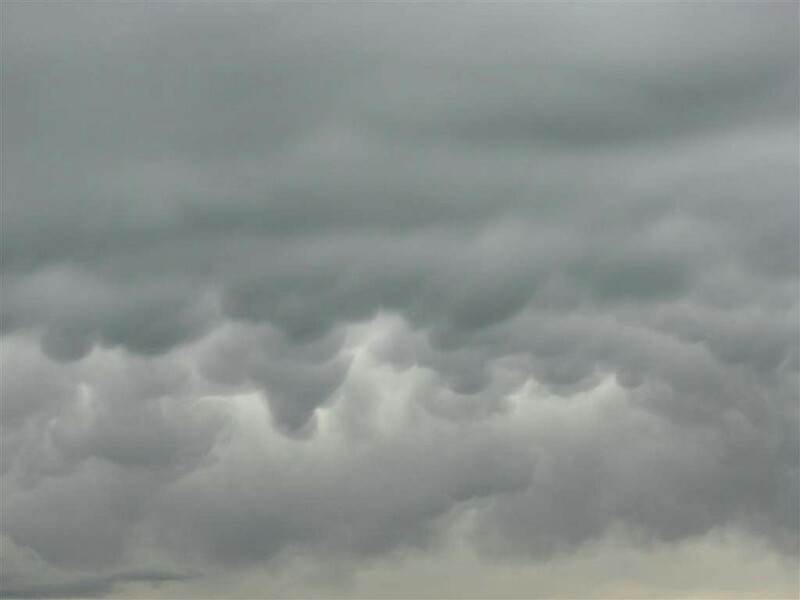 Another look at the mammatus inside the park. The wall cloud gets going again as we close in. 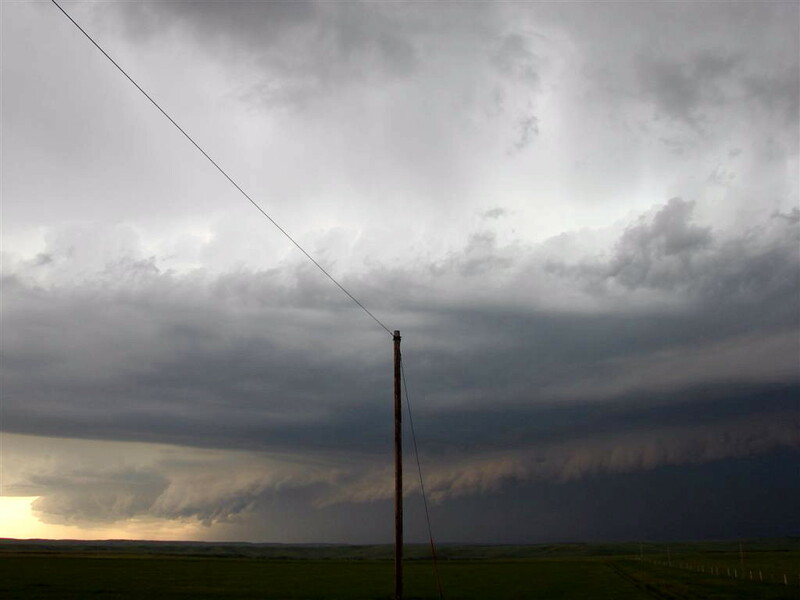 Roger's van crests the hill with the wall cloud to our south-southwest, but unfortunately we realize that we are going to get pummeled by the hail core if we keep going south and have to turn around. 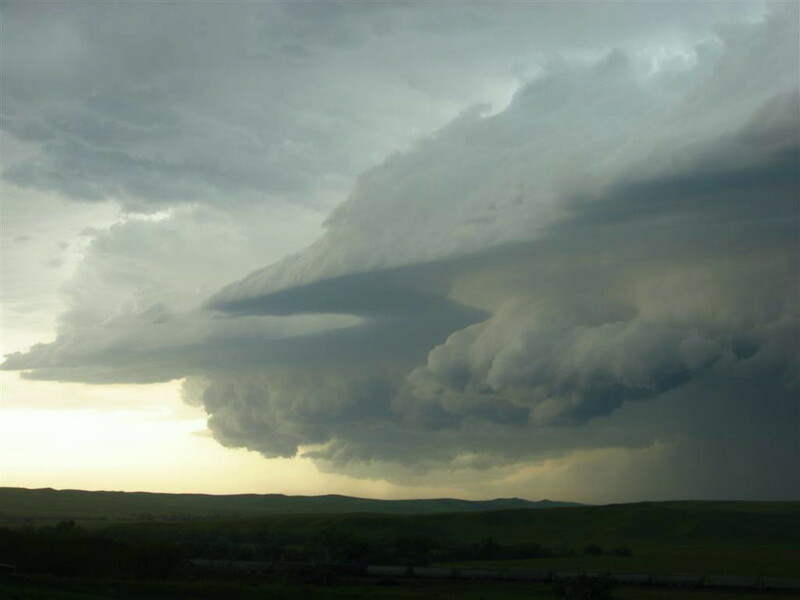 As usual, first you chase the storm, then the storm chases you! The wall cloud produces a lowering 1/2 way to the ground as we try to get out of the Badlands before the hail core eats us for lunch. 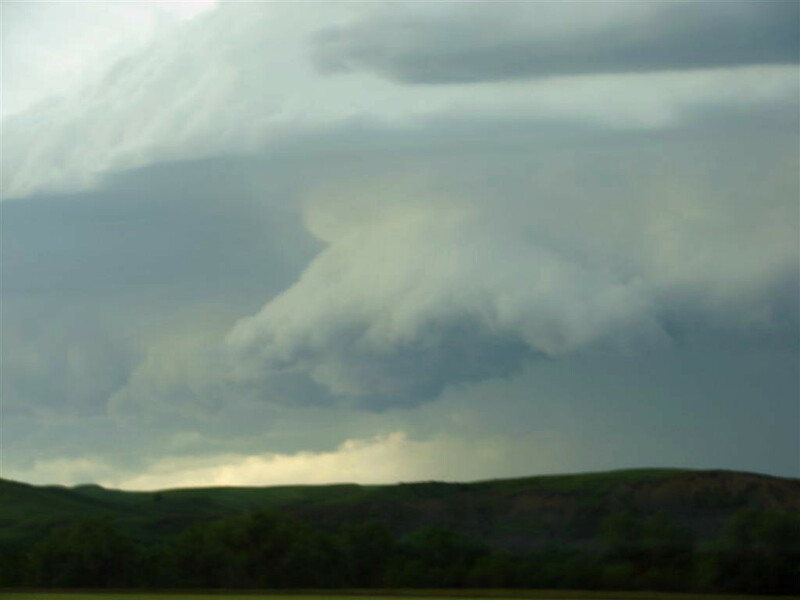 Another shot from the van of the lowering over the rough terrain of the Badlands. 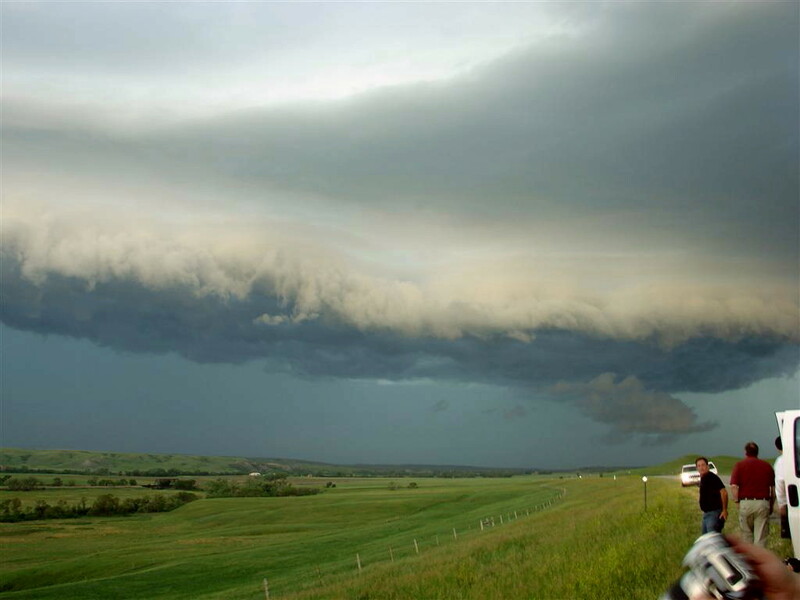 We get to the highway ahead of the storm, here still with a well defined "beaver tail" inflow steam. CG's from the anvil as we cruise east on I-90. A look into the "whale's mouth" as the storm becomes a high-precipitation monster! 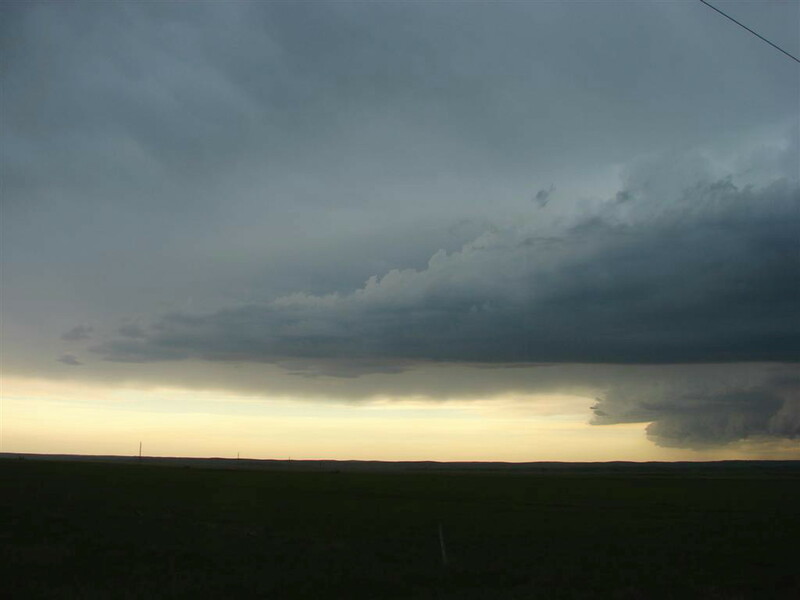 We head northeast from the highway towards Pierre as the storm chases. 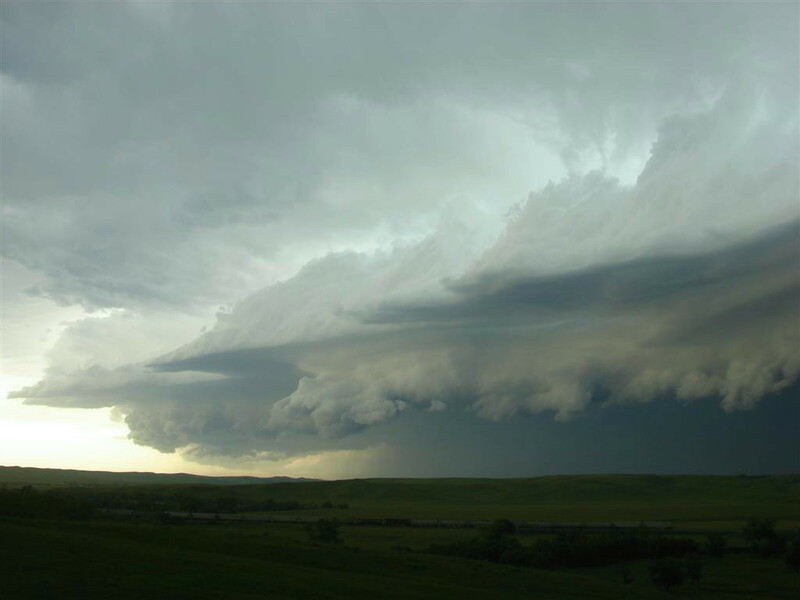 Here we stopped for a few to film the monster hail core heading towards us. At this point a line of several cells had merged and was bowing out heading north-northeast. 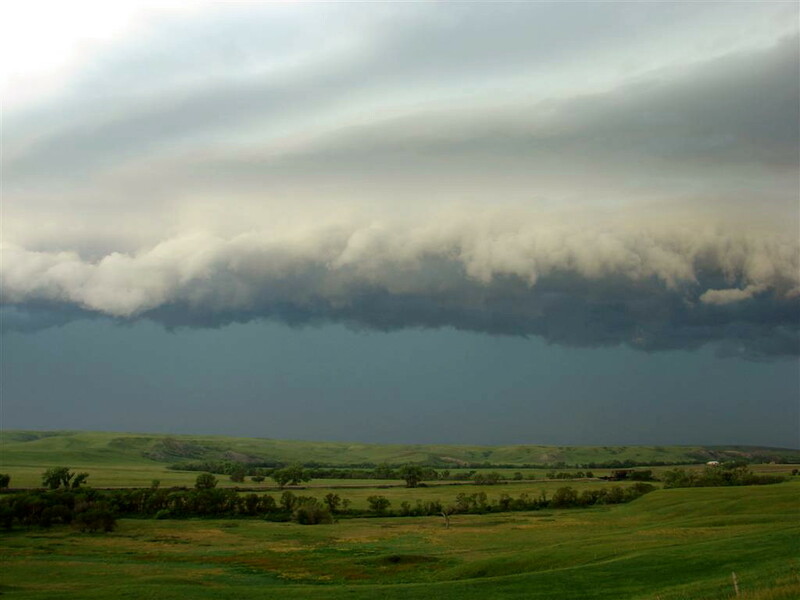 Shelf cloud with the turquoise glow of the hail core below and striations from mid-level rotation above. 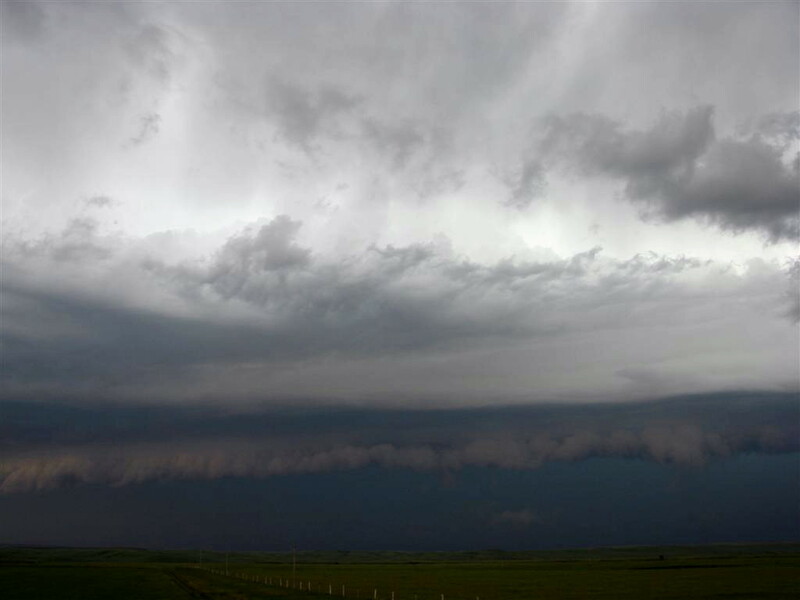 Cool structure of the shelf and lowerings from the individual cells in the line. This storm was so wide I couldn't get it all into one shot! It must have been 30+ miles wide. Lowering under the line. Another stop looking west as part of the line is now north of the road behind us. Finally entering Pierre we decide to let the core run us over while we eat dinner. By now it had weakened to the point where it didn't hail on us.